This article rounds up the top 5 best free video rippers/converters for Windows 7, Windows 8/8.1, Windows 10 and Mac OS in 2016. 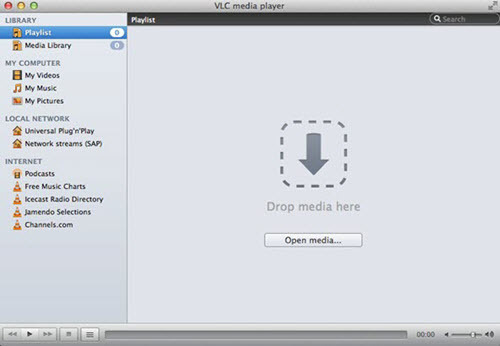 "Video Ripper" is an ambiguous noun that can refer to a video converter or a DVD ripper. But hereinafter we'll center on the free video conversion and video decoding software that are running on Windows and/or Mac (For the reviews of best DVD rippers, read here). Seeing that looking for a well-content video ripper is like searching for a needle in a bundle of hay, we prick off the easiest to use programs from the perspective of users. People will take the safety, usefulness, stability, update rates and the quality into consideration when choosing a free video ripper converter. The following tools not only do the trick in these aspects, but also probably have exhilarating features. Please read below and see whether a freeware can pique your interest and hit the spot. Developed by Digiarty Software which produces the famous WinX DVD Ripper, the free video ripper has survived for 10 years. It is a critically acclaimed Windows-based video related program featuring fast one-click operation and vivid ready-made profiles. Unlike most so-called freeware, it promises zero containing of malware or the like. Uniquely, it supports converting multi-track HD MKV, M2TS, AVCHD, HDTV and BDAV videos while delivering ultra fast speed and high quality with the assistant of High Quality Engine and De-interlacing Engine. Main Feature: Rip SD and HD videos and make video files playable on different devices and players. Extra Features: Allow adding external SRT subtitles; merging multiple files together; cropping, trimming, editing and adjusting videos. Note: the advanced version supports downloading video and music from YouTube and other online websites. MKV, AVI, MPEG, WMV, MP4, M4V, FLV (YouTube), H.264/MPEG-4, DivX, Xvid, MOV, RM, RMVB, VOB, ASF, 3GP, 3G2, QT, DAT, Google TV, WebM, VPX 8, MOD, M2TS, TOD, etc. Videos: MP4, AVC, AVI, WMV, MKV, MPEG1, MPEG2, MPEG4, RM, 3G2, 3GP, ASF, WEBM (VP8), FLV, F4V, SWF, DV, NTSC, PAL, TS HD, MTS, MOV HD, AVC HD, etc. Devices: Apple: iPhone, iPad, iPod, iTunes, iDVD, iMovie, Final Cut Pro; Android HTC, Samsung, Galaxy Tab, Kindle Fire, Google Nexus 7, New Nexus 7, Huawei, Lenovo, Acer, Asus smartphones and tablets; Microsoft WP8, Surface tablet, Xbox, Zune; Sony PSP, PS3, PS4, PS Vita, Xperia; Amazon Kindle Fire, Nokia, Blackberry, PDA, Zen, etc. Freemake Video Converter has been a good choice for millions of users. More than just a video ripper, it combines the video editing and the web downloading functions. Basically, it will turn full and ultra HD videos into different formats. With DirectX video acceleration technology, the free video ripper claims to be faster than before (it will still take 8 minutes to complete converting an 11-min video). But admittedly, its functions are really powerful. Main Feature: converting videos from one format to another. Extra Features: downloading online videos from websites, edits videos, burns DVDs, making photo slideshows, uploading to iPhone, etc. MP4, AVI, MKV, WMV, MP3, DVD, 3GP, SWF, FLV, HD, MOV, RM, QT, Divx, Xvid, TS, MTS, Fraps, AMV, AVCHD, AVS, BIK, BNK, CAVS, CBG, DPG, DV, DXA, FFM, FLC, EA, FLH, FLI, FLX, MTV, MXF, NUT, VRO, etc. Supported Audio Formats: MP3, AAC, OGG, WMA, WAV, FLAC, M4A, AMR, APE, M4R, etc. Similar to the other video ripper freeware in this post, Any Video Converter is capable of taking computer videos or internet downloaded videos into nearly any other formats, as the name implies. Without limitations and costs, it comes handy in ripping audio from CD and videos, transforming online videos to PC, laptop, Apple/Android smartphones/tablets. However, it has many bundleware. Main Feature: Aiming to enable playing back any video on any device. Extra Features: Downloading online videos on 100+ sites, saving music from YouTube directly; having DVD video NTSC or PAL profile options. AVI, FLV, MPG, MP4, M4V(without DRM), M2V, SWF, 3GP, 3G2, 3GPP, MOV, TS, TP, TRP, M2TS, MTS, MKV, DV, WMV, MOD, TOD, ASF, DAT, F4V, VOB, RM, RMVB, DivX, XviD, MXF, H.261, H.263, H.264, NUT, NC, NSV and more. Devices: iPad Pro, iPad Air, iPad Mini, iPhone 6S/6S Plus, Apple TV, Galaxy S III , Google Android, Kindle Fire HD, Sony PSP, Xbox 360 and more. 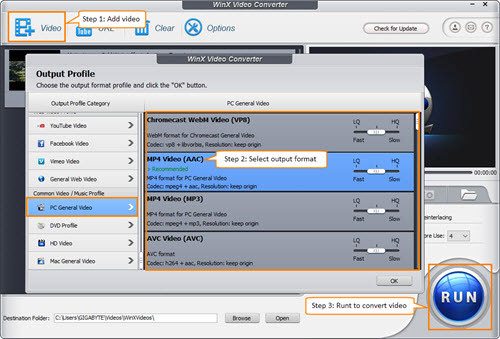 The number of specialized video rippers for Mac is limited, and MacX Video Converter Free Edition is one of the rare ones. It is precious because it really contains no spyware, malware, ads or bundle at all. It is a standalone video converter and decoder with 370 built-in video & audio codecs, and no strange HD video from camcorder, standard video or online YouTube video are supported. Customized to Mac users, it looks beautiful and runs smoothly and seamlessly on a Mac computer. Better still, it will always support the latest Mac OS, iOS and Apple devices (for example, iPhone 7, as one of the output format). What's more, it's extremely brisk and for ripping a 2 hour HD video, it only takes several minutes. Main Feature: Convert videos from Mac to Apple and other devices supported video files, extract audio from movies. 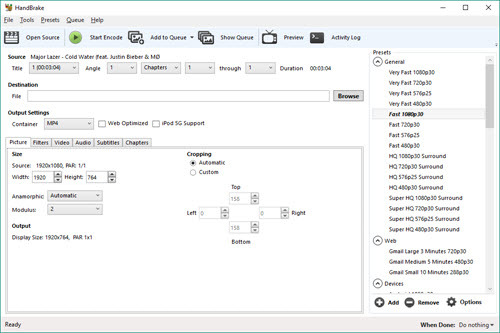 Extra Features: Trim, crop video, add watermark and external subtitle, make slideshows, adjust parameters. HD/SD videos; NTSC DVD, PAL DVD; audio formats such as MP3, AAC, AC3, WMA, AIFF, CAF, DTS, OGG, AU, RA, and (Lossless Audio WAV, FLAC and ALAC; profiles for Apple, Android and Microsoft devices and web sharing. Some people are familiar with NetShow Encoder as the precedent of Windows Media Encoder. As the freely downloadable app of Windows OS developed by Microsoft, Windows Media Encoder can't surely be absent from the list of top free video rippers. It works by capturing love and prerecorded audio, video and screen images for delivery purpose. But the output format can only be Windows Media formats. Integrated within Windows Media 9 Series, this app is helpful in enabling users to enjoy mixed-mode video and audio, high-quality multichannel sound, and high-definition video quality. However, this tool is now considered to be outdated. Supported Operating Systems: Windows XP, Windows 2000, or later Microsoft Windows OS. HandBrake Error Message: "No Titles Found"
Main Feature: Converting kinds of videos into an MPEG-4 video file in MPEG-4 Part 14 (.mp4) or Matroska (.mkv) containers. 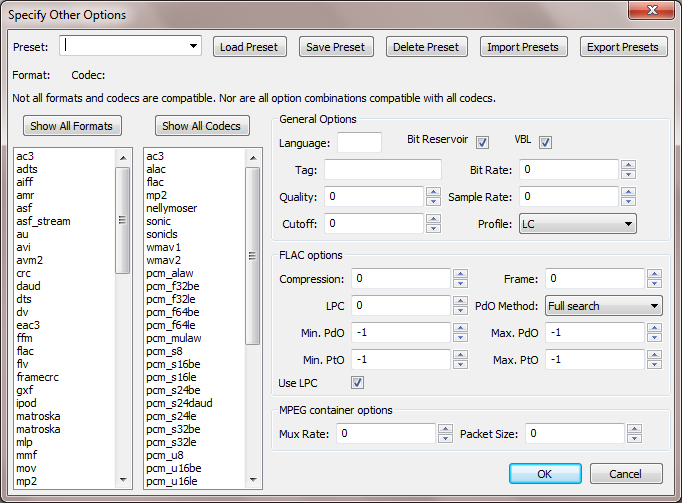 Extra Feature: Personalizing Constant Quality by changing bit rate, file size and sample rate; batch encoding. In a sense, VLC is only an open-source media player, instead of a video ripper converter. But look closer, it can help HandBrake rip DVDs and of course play CD/VCD/DVD discs the ripped DVDs in ISO format. VLC, the same as 5KPlayer, is a brilliant choice for getting your DVD rips/downloaded YouTube video clips played back conveniently. But it needs some codec packs when playing some codecs. Main Feature: Playing files, discs, Webcams, devices and streams. Extra Features: Installing extensions, adding skins. FFmpeg means "fast forward" and is inspired by the MPEG video standards group under the license of GNU Library or Lesser General Public License version 2.0 (LGPLv2). It is an open-source software project that records, converts and streams videos and audio. It produces libraries and programs for handling multimedia data and transcodes multimedia files. Main Feature: Audio and video conversion. Extra Features: Live broadcasts, video capture, etc. • Download and rip YouTube and other videos from 300+ online video websites. • Convert any SD, HD and 4K resolution video files perfectly. • 410+ profiles for Apple, Android, Windows Phone. • Have some bonus features to explore.